At $4,399, the Vision S70 Suspension elliptical is the company’s top model available for both the commercial and home markets. The console on the Vision S70 features LED windows with scrolling alphanumeric feedback and workout stats for time, distance, mets, rpm, watts, calories, heart rate, & heart rate, and resistance. 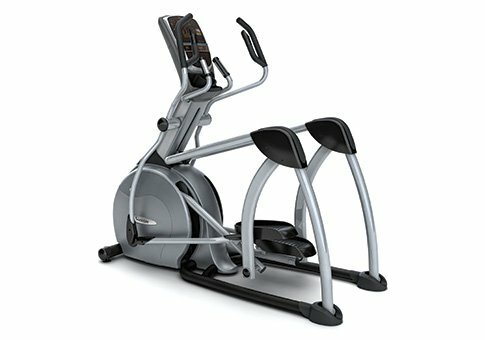 The Vision S70 Suspension elliptical features a self-powered Cambridge Motor Works™ Generator and a 2-stage Quiet-Glide™ Super Silent Poly-V belt drive system. The pedals and pedal arms are “suspended”; that is, this front-drive trainer has a track-less and roller-less ramp design that reduces maintenance needs and provides a super smooth and extremely quiet pedaling action. The PerfectStride™ technology brings together the elements of a unique elliptical foot path, pivoting footplates, stride length variation, and incline adjustments to let users of any size achieve the optimum stride motion. Within the PerfectStride™ design, Vision has changed the ellipse pattern to eliminate the downward and forward force of the stride so that the leg muscles are engaged throughout the stride, not just at the bottom which is a problem with traditional trainers. Furthermore, the 2" wide pedal spacing also helps to eliminate stress on the hips as you mimic your natural stride on this machine. Other features of the Vision S70 Suspension elliptical include remote controls on the hand grips, a 15% to 37% incline ramp (not available on the S60 model), 20 resistance levels, a variable stride length of 20" to 23", and a low 9-inch step-up height for easy entry. It also has wireless and chest strap heart rate telemetry and a 400-lb max user weight capacity. The 20 pre-set workouts include Sprint 8®, Intervals, Random, Fat Burn, Trails (2K, 5K, 8K), Glute Burn, Summit Hike, Mountain Trek, Stair Climb, Fitness Test, Custom, and Heart Rate Control (Target, Weight Loss, Hill, and Interval). The unique SPRINT 8® workout program is found exclusively on Vision Fitness machines. It is a medically tested and proven 20-minute workout that optimizes time and effort. Developed with Phil Campbell, MS, MA, and author of the book Ready, Set, Go! Synergy Fitness, this exciting program helps to maximize energy potential and weight control especially for those who have reached middle age. The Vision S70 Suspension elliptical gets solid reviews from current owners as well as industry pros, and certainly sets the bar higher for other brands to try and match. The only downside is the $4,999 price tag. This is a commercial level machine designed for hard use in a health club or recreation center, and as such, it is probably overkill for home use even if you and the family will be on it two hours a day. For a better option, we recommend you check out the residential Vision S7100 Suspension elliptical which sells for as low as $2,599. It also has the PerfectStride feature, suspension pedals, variable ramp and stride, and the Sprint 8® programming – and at a better value price for home use.